What was once slated to be a controversial subdivision is now a unique island preserve thanks to the Little Traverse Conservancy. Oden Island, located south of the village of Oden, juts out into Crooked Lake and is the home to large old-growth trees and fragile wetlands. When a developer proposed crowding 34 homes on the east half of the island, the Conservancy orchestrated a response in 2000 that included an outpouring of support and donations from communities and families to protect the natural side of the island. In only three months $1 million was raised to purchase the land and create a nature preserve. Today the 50-acre preserve offers a parking area, nearly a mile of foot trails, two trailside benches, and views along its mile of lake frontage. 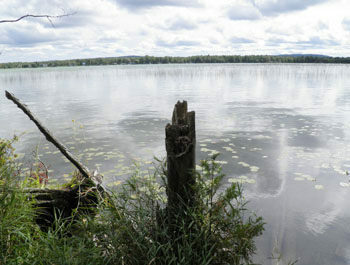 Reached by a bridge, Oden Island lies in almost the center of the Crooked Lake. The 2,300-acre lake lies in the upper portion of the Inland Waterway, a 40-mile navigable waterway first used by Native Americans to paddle and portage from Lake Huron to Lake Michigan. The waterway is now popular with recreational boaters who can head northeast to Cheboygan via a system of lakes, rivers and locks while kayakers have turned the preserve into a destination for a one-mile paddle from Oden. 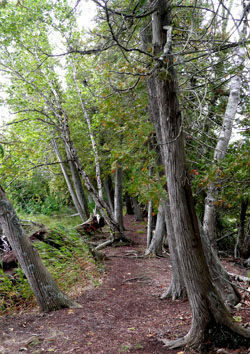 The trail system on Oden Island is marked as the Red and Blue Trails and together they can be combined for a 0.8-mile loop that backtracks only a small portion. From the parking lot you begin on the Red Trail but the first junction with the Blue Trail is quickly reached. This segment of the Blue Trail swings past the shoreline for views of the water and comes to a bench at Mile 0.2. It then swings away from the shoreline, passing an old growth pine just before arriving at a junction with the Blue Trail. Head east (right) to follow the Blue Trail to the tip of the island’s eastern point, passing a second bench along the way. Near the end you walk through a thin row of leaning cedar trees with Crooked Lake clearly visible on both sides. The end of the trail is reached at Mile 0.45 and from there you backtrack to the junction with the north segment of the Red Trail that winds through more stands of cedar before rejoining the Blue Trail. You’re now only a 100 yards east (right) from the trailhead. 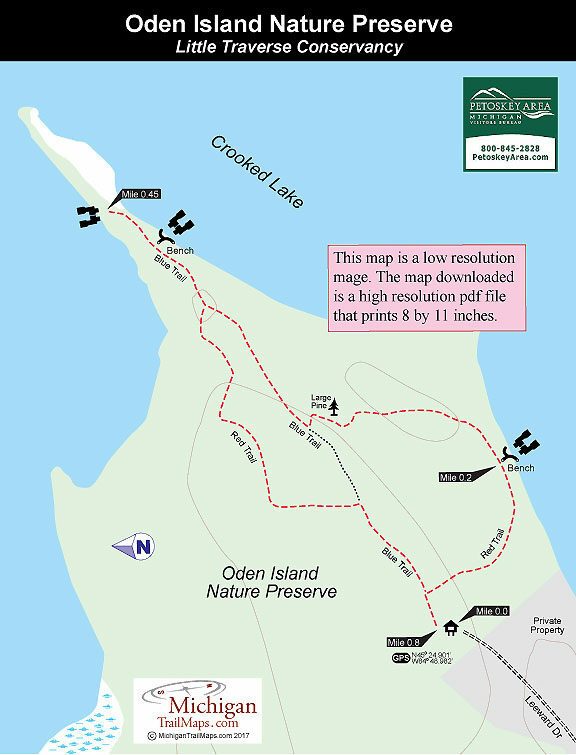 Other than a parking area and a display map, there are no other facilities at the Oden Island Natural Preserve trailhead. 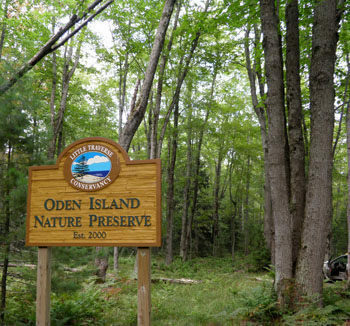 There are no vehicle or entry fees to hike on Oden Island. From Petoskey head north on US-31 for 3.2 miles And then turn east (right) on to Pickerel Lake Road. Follow Pickerel Lake Road for 4 miles where it becomes Channel Road and continue another mile to Oden Island Road. Turn north (left) on Oden Island Road to cross a bridge onto the island and then turn east (right) on Leeward Drive. Conservancy signs will direct you to the end of Leeward Drive to the posted trailhead and parking area.